eToll costs are looming on the horizon for all of us in Gauteng since the Constitutional court yesterday set aside the Interdict imposed by the North Gauteng High Court earlier this year. 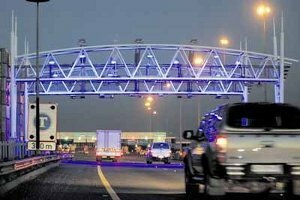 While the fight is still not over to halt etolling, the reality is that at some stage will al very likely be forking out a hefty sum every month to use the major freeways around Johannesburg. In order to prepare your budget for eTolling, the very best and easiest way to do so is by saving on your car Insurance by getting car insurance quotes from South Africa’s top car insurance companies. Experience has shown that on the average, consumers are able to save up to 32% on their car insurance costs simply by getting quotes and comparing each of the car Insurance companies offerings. WOULD YOU LIKE TO BE SAVING 32% OF YOUR CAR INSURANCE COSTS? Of course you would! Complete the quote request form and we will call you right back to gather a little information about you and your car, we will then present you with car insurance quotes from the different insurers for you to compare, simple as that! Getting cheaper car insurance is the easiest and most effective way to start preparing for those unexpected eToll costs. Even if eTolls only come into effect in a years time or never at all, you will be saving a hefty amount every month which you could use to reduce your bond, pay towards schooling or just enjoy a night out. The reality in the car insurance industry is that the insurnace companies are competing furiously for every potential customer and the way they do this is by offering, 1. better premiums than the other insurers, 2. better cover like no excess car insurance and 3. By offering better and faster claim processes.